Deb Stahl (left) is shown receiving a donation check for $5000 from Brad Rarick, Rotary President Elect. Photo by Dr. Michael Barrow, M.D. CLAYTON — Deb Stahl, a leader with The Community Table, recently visited the Northmont Rotary to explain some of their programming. This faith based organization has four basic ministries that are utilized to support the local community. The Front Porch Ministry is designed to help individuals that find themselves in a difficult spot. Whether it is being unexpectedly out of a job, having difficulty with finances or paying bills, or needing someone to attend appointments with them, The Community Table can be a resource. The Church/School Ministry helps Northmont students with a Back to School Fair Ministry. At this fair, families can obtain back to school supplies, backpacks, gently used books, etc. Backpack Food Friends Ministry is designed to help children from low-income homes in our community to receive adequate food through the weekend when the state funded meals through the school system are not available. Every week a backpack filled with easy to prepare foods is delivered to the schools and handed out to the children on their way home. At Christmas, The Community Table also operates a Christmas Store ministry. Parents that are unable to provide Christmas presents for their children can be referred for participation in this program. Parents are then invited to “shop” at the Christmas Store to pick out a gift for their child to open on Christmas Day. The Northmont Rotary believes this organization is making a significant difference in our community and supports its mission and efforts. The Northmont Rotary Club meets at noon each Tuesday at Meadowbrook at Clayton, 6001 Salem Ave., Clayton. 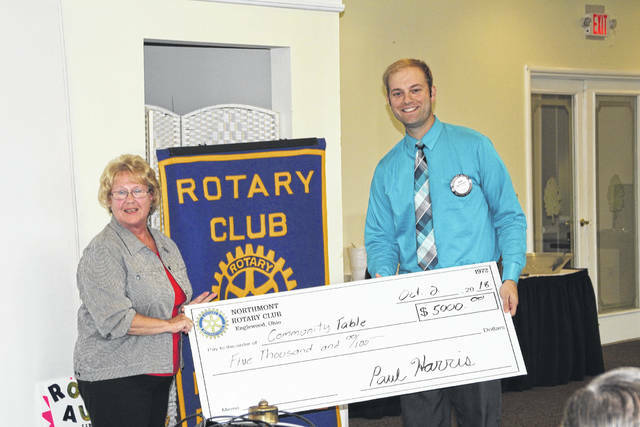 https://www.englewoodindependent.com/wp-content/uploads/sites/26/2018/10/web1_Stahl_Rotary.jpgDeb Stahl (left) is shown receiving a donation check for $5000 from Brad Rarick, Rotary President Elect. Photo by Dr. Michael Barrow, M.D. Reach the Northmont Rotary Club at (937) 540-0012.